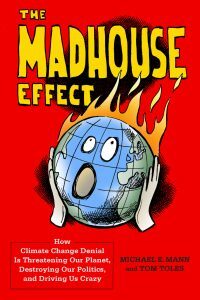 In fall 2016, I co-authored the book “The Madhouse Effect: How Climate Change Denial is Threatening our Planet, Destroying our Politics, and Driving us Crazy” with Washington Post editorial cartoonist Tom Toles. At that time, many felt that climate change denial had been rendered irrelevant–that we were past it, and ready to tackle the problem head on. 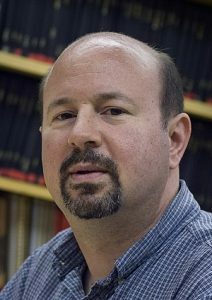 With the election as President of Donald J. Trump— an individual who rejects the overwhelming consensus of the world’s scientists that climate change is real and human-caused — denialism however has now officially infected the very highest level of our government. The official policy of the U.S. government is distraction, denial and delay, and doubling down on our headlong exploitation of dirty fossil fuel energy. I update the story told by The Madhouse Effect using humor, satire and where appropriate, ridicule, built around Tom Toles’ famously insightful, edgy, and provocative climate-themed cartoons in the Washington Post. I will review the scientific evidence of climate change, the reasons we should care, and the often absurd efforts by special interests and partisan political figures to confuse the public, attack the science and scientists, and deny that a problem even exists. Despite the monumental nature of the challenge we face, particularly in the era of Trump, I will explain why I’m cautiously optimistic we will prevail in the greatest battle human civilization has ever faced—the battle to avert catastrophic and irreversible climate change impacts. MAREA is so pleased to have Dr. Mann share his expertise, research and experience with us. We hope you’ll join us! The presentation is Tuesday, May 28 , at 7:00 at TEKPark (9999 Hamilton Boulevard, Breinigsville, PA 18031, between Kutztown and Allentown).